Running back Donnel Pumphrey played in his first preseason game Thursday night after missing the first three with a hamstring injury. The 2017 fourth-round pick, who spent last season on injured reserve with a hamstring injury in the same leg, looked pretty good, particularly in the passing game. But all of the time he's missed this summer has put him behind Wendell Smallwood and undrafted rookie Josh Adams for the fourth running back spot. A roster spot for Hector? Rookie defensive tackle Bruce Hector has played a lot in the preseason and has played pretty well. With Tim Jernigan out until at least November, Hector, an undrafted free agent, appears to have moved ahead of 2017 seventh-round pick Elijah Qualls for the fourth and likely final DT spot behind Fletcher Cox, Haloti Ngata and Destiny Vaeao. Quarterback Christian Hackenberg saw his first action with the Eagles since being signed nearly three weeks ago. The thinking when they signed him was that maybe he would wind up on the practice squad, where they could see whether he might be a potential candidate to be the No. 3 quarterback next season after Nick Foles leaves. But he did little against the Jets to give them reason to want to do that. He scrambled for more than 60 yards, but turned the ball over three times, including a pair of interceptions. The Eagles are expected to keep six wide receivers. Alshon Jeffery, Nelson Agholor, Mike Wallace, Mack Hollins and Shelton Gibson have locked up the first five spots. The last spot is expected to go to either DeAndre Carter, who is with his fifth team in three years but has never made a 53-man roster, or six-year veteran Markus Wheaton. Wheaton, who caught 97 passes for the Steelers in 2014-15, has been hurt much of the summer and played in his first preseason game Thursday. He didn't have any catches. 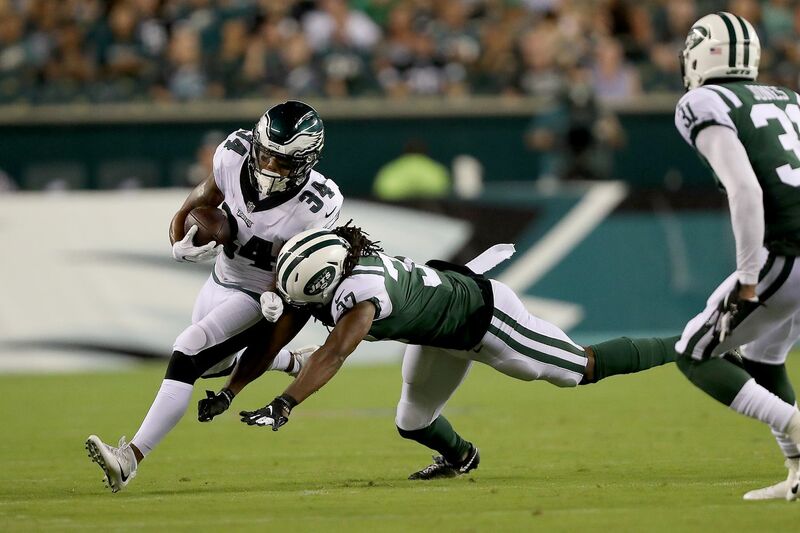 Carter, who had four catches for 73 yards last week against the Browns, had two more for 37 yards against the Jets. He also returned punts and kicks. Carter would appear to have the edge over Wheaton, though the Eagles could end up picking up another wideout after teams make their cuts. Veteran guard Chance Warmack probably is in jeopardy of not making the team. The former first-round pick played most of the first half Thursday. Isaac Seumalo, who can play both center and guard, will be the team's top season-opening interior backup. And rookie sixth-rounder Matt Pryor can play both inside and outside. Rookie offensive tackle Jordan Mailata, the former Aussie rugby player, is going to be on the team's season-opening roster. Which means the only way Warmack makes the team is if they decide to keep 10 offensive linemen, which seems unlikely.